18V ONE+™ LITHIUM+™ String Trimmer/Edger is rated 4.6 out of 5 by 1801. Rated 1 out of 5 by Rocky from Mostly agree with crs1306 Grab and Go! ……….with one exception. This is a replacement under warranty. It appears there is a design flaw and I may possibly be returning this second trimmer as it is exhibiting the same problem as my original Ryobi trimmer. The line string somehow gets wound close to the motor onto the motor shaft. I have to stop and untangle the line every so often. This problem most likely caused the first trimmer to break off the shield which is a molded part of the housing. Obviously this shield is not doing its job and eventually causing it to brake off completely. I am using the specified replacement line and it also happened with the original loaded line when new. Rated 1 out of 5 by ROCKYD from REPLACEMENT TRIMMER SAME PROBLEM This is a replacement under warranty. It appears there is a design flaw and I may the same problem as my original Ryobi trimmer. The line string somehow gets wound close to the motor onto the motor shaft. I have to stop and untangle the line every so often. This problem most likely caused the first trimmer to break off the shield which is a molded part of the housing. Obviously this shield is not doing its job and eventually causing it to brake off completely. IT MAY ALSO BE A PROBLEM WITH THE LINE ADVANCEMENT AUTO-FEED LETTING TOO MUCH LINE OUT. I am using the specified replacement line and it also happened with the original loaded line when new. 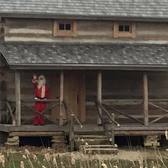 Rated 1 out of 5 by Blondie123 from Not happy with battery life! 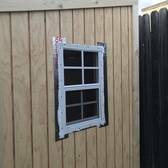 I bought this product yesterday at Home Depot. I fully charged the battery yesterday and this morning used it for the first time. Battery life was only 26 minutes. I recharged it -- which took quite a length of time -- and just finished using it again. This time battery life was 25 minutes. The box proudly proclaims "Up to 1 hour run time." Sorry but I'm not getting even 1/2 hour of run time. This is not acceptable in the light of the representation you made and upon which I relied in buying the product. The only way I can have 1 hour worth of run time is for you to provide me with a second battery ... and I would appreciate it if you would do that. Rated 5 out of 5 by crs1306 from Grab and Go! Before purchasing my One+ trimmer I only edged about every 4th mowing. It was a major hassle dragging out 150 feet of extension cord and dragging it around behind the edger. Heaven forbid trying to use any of the 3 gas trimmers I owned. Noisy, hard to keep running, mixing gas and oil - nope, needed something different. The Ryobi 18V One+ trimmer satisfied both needs. I can edge my driveway and trim around my trees on one battery. No hearing protection needed and I think I actually get done faster then with my Gas trimmers since I don't have to fuss with the Ryobi at all. 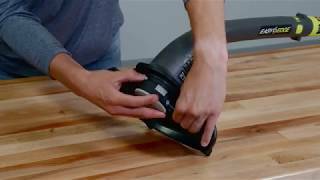 Just grab a fully charged battery out of the charging station, put it in the trimmer and get to work! Rated 1 out of 5 by Slimtrim from Quite definitively, worst tool ever I'm taking this machine back to Home Depot for the 2nd, and final, time. The first time I swapped it out because the small piece that cuts the line (to prevent it from getting too long and wrapping around the head) would not stay screwed in to the guard. This was 2 days after initial purchase. With the 2nd trimmer, I find that that sane2 piece stays in place but doesn't actually trim the line. So the line repeatedly wraps around the head, stalling the machine and not cutting grass. I'm returning to Home Depot to swap out for another brand. 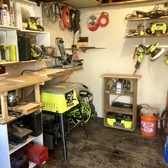 This was my first experience with any Ryobi product. Bleh. Rated 4 out of 5 by Tom1947 from Surprisingly Powerful Trimmer I like everything about the trimmer so far with two exceptions: First, it is fairly heavy, and even when the adjustable handle is moved down as far as it will go, the machine's weight is not well balanced and it is a little tiring to use for more than about ten minutes. Second, I wish that it was designed such that the cutting head, grass shield, and motor could be hosed off after use. I spoke with a Ryobi representative on the phone, and she told me not to use a hose because of possible water damage to the electric motor. These two concerns aside, I think it's a great, high-quality lawn tool and I'm happy to have it. Rated 4 out of 5 by Jared from No more gas I bought this to replace my gas trimmer. I was surprised that this one does just right for my lawn. It also made me relize my old gas 2 string trimmer was way overkill for trimming grass and edging. That said this trimmer is for grass lawns. I would not buy this for weed control. It just doesn't have the power needed for that in my opinion. First use on the lawn and I'm convinced this trimmer will do great work and I'm very happy to move on from the gas trimmer. Also a plus my city has a small rebate for green lawn care equipment so that was nice as well. Giving four stars for being a little weak on power and seemingly heavy for what it is. Overall very happy however. Rated 5 out of 5 by Retired Racer from Nice dual purpose machine! Switching between trimming and edging is super easy. Using it as an edger was easier than I expected, and it does a very nice job. When I first started using the trimmer, the string was advancing constantly, leaving short pieces of dayglo green across the lawn. That was annoying! When I switched to the hard blades and then back to string, the string started advancing correctly, so perhaps the assembly was not installed correctly at the factory. The large battery gave me plenty of run time. 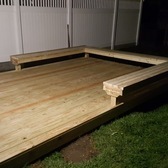 I'm impressed enough to have added a reciprocating saw, brushless impact driver and brushless drill in the week since I purchased the string trimmer. 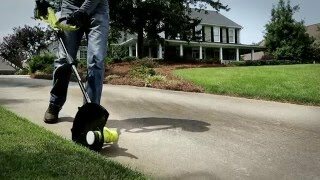 Introducing the greatest RYOBI 18v String Trimmer to date! With it's lightweight and compact design, this trimmer is easy to operate and a breeze to store. Easily adjust the cutting width from 11 to 13 in. for the ultimate control. This unit also comes equipped with a pivoting head that allows the user to switch between trimming and edging in a matter of seconds. Best of all, this kit includes a 4.0AH Lithium+ Battery which is the most powerful 18v battery offered by RYOBI. This battery delivers longer runtime along with fade-free power. 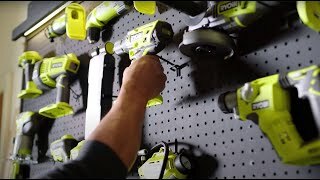 All of this, along with the RYOBI 3 year warranty, make this the perfect time to go cordless! How do I attach the grass deflector to my gas string trimmer? Remove hex screw, washer, and wing nut from the grass deflector. Press the grass deflector onto the bottom of the shaft. Insert the hex screw through the grass deflector and the bracket on the shaft. Place the washer on the hex screw. Place the wing nut on the hex screw and tighten securely. 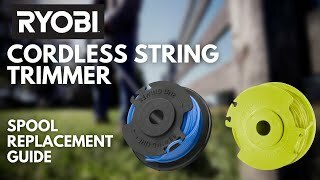 How do I advance the line on my RYOBI Cordless String Trimmer? NOTE: Your RYOBI Cordless String Trimmer is equipped with an auto-feed head. Bumping the head to try to advance the line will damage the trimmer and void the warranty. With the trimmer running, release the switch trigger. Wait two seconds, and press the switch trigger again. NOTE: The line will extend approximately ¼ in. with each stop and start of the switch trigger until the line reaches the length of the cut-off blade. How do I replace the spool on my RYOBI Cordless String Trimmer? NOTE: Use only .065 in. round or .080 in. twisted monofilament line. Push in tabs on side of spool retainer. Pull spool retainer up to remove. To install the new spool, make sure the line is captured in the slot on the new spool. Make sure the end of the line is extended approximately 5 in. beyond the slot. Install the new spool so that the line and slot align with the eyelet in the string head. Thread the line into the eyelet. Pull the line extending from the string head so the line releases from the slot in the spool. Reinstall the spool retainer by dressing tabs into slots and pushing down until spool retainer clicks into place.